Hello everyone. I hope you all have a wonderful debt free Friday. 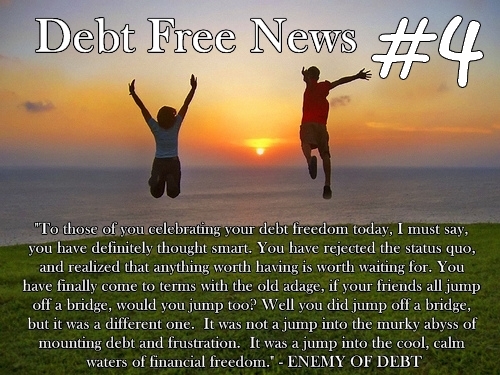 I’ve decided to share another Debt Free News From A Debt Free Reader submission with you today. One of the things I’ve learned from listening to people call into the Dave Ramsey Show to scream they’re debt free—hearing that call makes a HUGE difference. Hearing someone else to the point of tears after finally paying off that debt is an emotional experience. Paying off debt is like running a marathon. It takes A LOT out of you—tremendous strength, discipline, sacrifice, and endurance—but each and every cramp is worth the reward of crossing the finish line. Tears are a part of that experience. Those calls are very beneficial and extremely motivational for people who are paying off their debt. Those calls can also inspire someone who has never given it a second thought, to pay off their debt. That’s what I hope to accomplish with this series. You get to hear real stories, from real people who have DONE IT! And YOU CAN TOO! Today I want to introduce you to Peter from Bible Money Matters. One of my favorite pages that he has put together, is where he introduces you to Dave Ramsey. (Dave Ramsey is the author of The Total Money Makeover and the man behind Financial Peace University. He is the person that inspired my wife and I to get rid of our debt once and for all!) Peter has gone to great lengths to take you through the process. 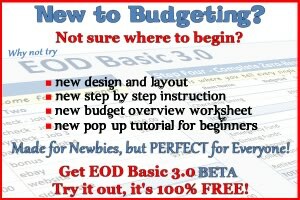 If you have ever “carried a balance, what was your highest debt at any given time, and how long did it take you to pay it off? My highest debt that I have ever carried was after I got married back in 2002 when I had about $20,000 in student loan debt, $2-3000 in credit card debt, a car loan of about $7000 and a mortgage of about $210,000. It took us a while to realize just how bad carrying the debt was, and we didn’t pay off the debt for several years. But once we did we did it quickly. It was probably in 2006 that we finally paid off my student loans (my wife didn’t have one, she was smarter than I was), our car loan, and all credit cards. Since that time we haven’t carried any more credit card debt, and have paid cash for pretty much everything. Our last car was purchased used with cash, no car payments. Now we pay ourselves a car payment, building up a reserve for the next time we need a car. We still have a mortgage, but we’ll be starting to pay extra payments on that starting this year, and hope to pay that off as early as possible. Paying off our debt was much better than I thought it would be. I still remember the overwhelming sense of peace that flooded over me when we got notice that our last student loan had been paid off. It meant that we were now in a place where we were completely free of the chains of debt, and we would be able to do more good with our money instead of just paying off the interest on our debts. Paying off our debts allowed us to be able to give even more to our church and other charities this past year, which was a great feeling! Along the way we’ve had a lot of struggles, mostly with medical problems that my wife has had to deal with. In 2008 my wife had a catastrophic blood clot in her leg which in the end almost took her life. She was in the hospital for a month and had 4-5 surgeries to remove the blockage in her leg. When all was said and done she had amassed over 250,000 dollars in medical bills, which thankfully were all paid for by our health insurance except for about $2500 (which we had it reduced to by asking for a reduction in our hospital bills). Again in 2009 my wife had to deal with another health crisis and required another surgery, leading to another $2000 in medical bills. Our story is a good example of why even healthy people should carry health insurance. You never know when something will come up requiring you to have huge medical bills like we did. A mindset that you’ll never go into debt again unless it is absolutely necessary. You have to plan for the future, save up a big emergency fund in case of a big problem like we experienced, and just make a goal that you’d like to be out of debt no matter what it takes. You have to be committed to the goal, otherwise it won’t happen. They’re crazy! Having debt isn’t essential, in fact some of the wealthiest people are the ones who have learned to live without debt. Eating out was one of our biggest problem areas and a place where we spent a big chunk of change every month. We had to cut back on spending in that category drastically in order to reach our goal. Now that we’re out of debt we’re able to eat out a little bit more, but we still don’t quite as much as we did before. I think one thing that changed the most was our relationship to money – and to things. We realized that money and things are not the most important things, and that living a life free of debt and obligations to others allows you to go give more freely, and be happier with the things that you do have. Our families and friends didn’t even know that we were in debt I don’t think. We’re pretty private about our finances. In fact, it’s kind of funny, my in-laws still to this day don’t really realize how well we’re doing now, and are always offering to help us with money – even though we don’t need the help. Our friends that did know we were getting rid of debt were very supportive because many of them were taking Dave Ramsey‘s Financial Peace University class with us, and were also working their way out of debt. It is funny, however – we do see a lot of people to this day that really are skeptical of our debt free attitude, and think that you can only get ahead by leveraging credit, and using debt to finance a certain lifestyle. If only they knew the freedom that comes with being debt free! This year we plan on starting to invest more since we’ve finally built up a nice big 8-10 month emergency fund in savings. So now we’ll be investing 20% or so, making extra payments on our mortgage and giving more to our church and others. That is the reason why we’ve worked so hard to be debt free, so that we can be more free to give to others when we want to, to invest enough money for our retirement, and to live the life that we want to live! Great story, Peter! I just love this series and look forward to each new debt free story. Just lost my job because I could not return to work when the family leave expired. It will still be weeks/months before I can look for another job. Thank the Lord that my husband & I listen to Dave Ramsey and have paid for cars and an emergency fund! We will be okay, tight but okay. The story today lifted my spirits. Thanks. Brad – thanks for providing this profile, do you plan to do more? You can read books about how to do this mechanically, but it helps to have the blow by blow from real people. Peter – thanks for being transparent about a subject many don’t like to speak of (esp since you’re private about your finances to begin with).